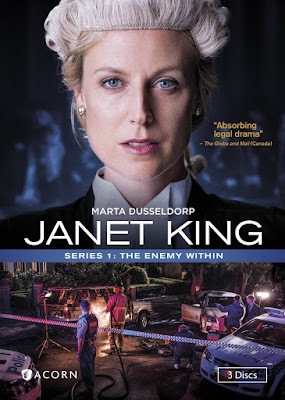 JANET KING, Series 1: The Enemy Within (DVD Debut) - “Acorn’s superior legal drama” (TV Guide) and “Marta Dusseldorp is effortlessly cool as Janet King, a fully developed female character that we don’t see often enough on our screens.” (The Hoopla) - Beloved Australian actress Marta Dusseldorp (A Place to Call Home, Jack Irish) stars in this gripping, new legal drama as a senior crown prosecutor. Determined to prove she still has her edge, Janet returns from maternity leave to find her workplace even more demanding than when she left. She quickly becomes involved in a high-profile and controversial case, making several enemies throughout her search for the truth - enemies that will threaten her career, family, and ultimately her life. Premiered on Acorn TV. This series centers around Janet King. She is a senior crown prosecutor in Australia. We follow her through a variety of high profile cases. Though she is often threatened both privately and professional, she always holds her ground. The series includes eight fantastic episodes. A Song of Experience- Janet's first case after returning from maternity leave involves a police commissioner named Blakely who assisted his wife in an easy death when she was terminal. But was that really what she wanted? Every Contact Leaves a Trace - A biker is accused of murder despite minimal proof. Janet is forced to spend a lot of time away from her family. Natural Justice - The Moreno case intertwines with the Blakely case, and Diane is starting to crack. The Third Man - Danny Novak is seen with Blakely on the day he goes missing. Lina attends compulsory psychological counseling. 5. Lurking Doubt - Janet and Erin are accused of having an affair. The Moreno case trial judge is brought in. Ash and the kids leave down after being threatened. 6. Overtime- Jane believes Moreno is involved in Blakely's murder. She questions his daughter to gain more information. Lina wants to resign. Ash and the kids are still in hiding. 7. An Achilles Heal- Another body is found linked to the Blakely. The crown attorneys want Maya to testify against Nelson again. 8.The Greatest Good - Blakely's son reveals startling new information. Danny Novak is arrested. A new and suspect is located. Janet is frantic to protect her family. I really loved this series. It centers around a strong female character and is packed with action and intrigue. If you'd like to grab a copy of this awesome DVD for yourself, you can find it online at Acorn Media or on Amazon.